Vista Transformation Pack gives to your Windows XP system the fresh and cool look of Microsoft's new operating system: Windows Vista. The pack changes most of the system icons, skins and toolbars and also adds new enhancements to your desktop such as a dock bar or a different system tray clock. You sure will be surprised if you hear this. From now on you can update Vista Transformation Pack without uninstalling and you can even integrate Vista Transformation Pack into Windows setup files. (Still experimental, though but most of them are fine enough to be implemented). Are you have software, hardware, or operating system problems and don't know what must you do ??? Don't Panic! It's the answer !!! A ebook by Dan Gookin, bestselling author of Buying a Computer For Dummies. Part 1 : What the @#$%&*!? What a great Matrix Screensaver !!! So, Download This Amazing Screensaver and Try It !!! -Insert "picture/wallpaper" for folder background. -Text Color for every name of folders/files in your folder. -Insert info/comments on your folder. Now... You have 'Attractive' folder, different with others ! Kamus 2.0 is an English-Indonesian Dictionary and vice versa. This program is released as freeware for personal and non commercial used. Even many dictionaries software available, this software is different from the others, it tries to give you more easily translate words and also help in reading. · Small size for easy distribution. · Simple and easy user interface. · Automatic search between English and Indonesian languages. · Auto remove non alpha character such as !',:;.? "-)\(*/+, etc. · Highlight result for Indonesian. · Find exact word, contain text and Phrase. · Adding new word and phrase. · More that 41.000 English-Indonesian word, 35.000 Indonesian-English word and more that 64.000 phrase. · 20 nice skins with optimization. · Support Transparency ( Win 2k, XP and Up ). With "Install It and Forget It" feature, it works automatically and quietly in the background on your computer, constantly keeps your computer safe, error-free and running at top speed. Compared with its nearest competitor, Advanced WindowsCare v2 Professional provides the more essential and practical formula for Windows. *Install it and forget it. *Works continuously, automatically and quietly in the background on your PC, allowing you to have fun and be more productive. *Updates itself in a smart and automated way. *Scans and removes spyware and adware with the latest definition. *Prevents spyware, hijackers and bad websites from being installed. *Erases the history of all activities in your computer. *Scans and fixes invalid and improper registry entries. *Detects and removes invalid startup items. *Repairs system configurations, eliminates system bottlenecks and prevents crashes. *Searches and Cleans up unused Windows garbage. *Fully optimizes Windows for ultimate system performance and top Internet speed, based on how you use your PC and what kind of network you have. Effective help (365x 7/24) whenever you need it. Provides continuous feature and function updates to subscribers. Provides with extra useful system tools. Analyzes and shows detailed information of hardware and Windows. X-FAST, using parallel computing and multithread technology, provides the world-leading speed for scan, repair and optimizing. X-DEEP thoroughly examines Windows system, accurately detects the bottlenecks slowing down and crashing your computer, automatically finds the best ways to fix them. X-SAFE promises to avoid deleting system files and damaging registry entries with trust area and black list technology. X-EASY makes sure that various scalable functions be executed within 1 working cycle. This technology highly simplifies operation of traditional system utilities. X-RESTORE is always active to automatically backup all of your changes in background, fully supporting Windows XP Restore function. X-OPTIMIZE dramatically boosts computer operation and Internet connection speed, according to PC type and network type user chooses. X-AUTO lets all jobs work automatically and quietly in the background, constantly keeping your computer safe, error-free and running at top speed. File Editor 2000 is a small utility that allows you to view and modify binary files. You can search for specified hexadecimal and ASCII strings. 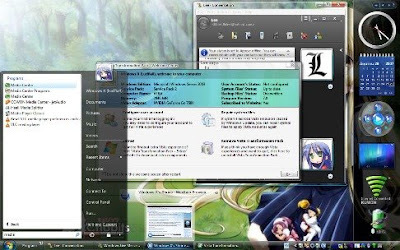 Most commonly used menu commands are available on the application's toolbar ribbon. SpeedFan is a freeware program that monitors fan speeds and temperatures in computers with a known monitoring chip. Its main feature is that it can control the speed of the fans according to the temperatures inside your pc, thus reducing noise and power consumption. SpeedFan can also access S.M.A.R.T. HD data and temperatures (if available). Use the installer and read the HELP FILE. Double Click AutoEndTasks and insert 1 on Value Data. Make a new DWORD Value and names it with NoSharedDocuments. Double Click NoSharedDocuments and insert 1 on Value Data. Make two-New DWORD Value and name them with fSavePageSettings and fSaveWindowPositions. Double Click on fSavePageSettings and fSaveWindowPositions and insert 1 on every Value Data. Double Click fWrap and insert 1 on Value Data. Make a new DWORD Value and names it with NoRecentDocsHistory. Double Click on NoRecentDocsHistory and insert 1 on Value Data. Make a new DWORD Value and names it with DesktopProcess. Double Click DesktopProcess and insert 1 on Value Data. Make a new DWORD Value, names it with EnableAutoLayout. Double Click EnableAutoLayout and insert 1 on Value Data. Click menu Edit > New > Key and names it with AlwaysUnloadDLL. On Default Value option, insert 1. Double Click on DisablePagingExecutive and insert 1 on Value Data. (Warning: When this tweak is active, Windows never does a paging file on hard disk. Operating System and other programs become more responsive. Only for computer that has memory more than 128 MB). Double Click on LargeSystemCache and insert 1 on Value Data. If activated, sistem will allocate all of memory (except 4 MB for disk caching) for file caching. Computer will does a caching kernel XP in memory until Windows XP process becomes faster. Double Click WaitToKillServiceTimeout and change the value less than 2000. Double Click on Start_LargeMFUIcons and input 1 on Value Data. Double Click s1159 and change text AM with Morning(Or Others). Double Click s2359 and change text PM with Evening(Or Others). Make a New DWORD Value (if not yet available) and names it RunCount. Double Click RunCount and insert 0 on Value Data. You're A Mysterious Person ??? Full Design featuring Full Color. Edition of This Vector Wallpapers Collection will Coloring Your Days. Place on your desktop, notebook, handphone, PDA, MP4, or your other GADGET and depict your emotions today. Hot Line and Arrow's Ready To Fill Out Your Desktop !!! Maybe you can download this wallpapers for your Gadget - Background Collections. The Topic on Part 3 at this time is 'Lovely Pink & Heart'. Contains with perfect creation of Pink Color and Heart Art on every Image. Download This Wallpapers Collection HERE !!! The topic of this Vector Wallpapers are 'Tree on Vector Design'. So, the design of every Vector Wallpaper contains with 'Tree Creation'. This is real Vector Wallpaper as you know. It's very cool and beautiful art for your images collection. Download This Vector Wallpaper Part 2 Only In Here... !!! Free for your free soul !!! Thats all the contains on this file maybe can't call with Vector Wallpapers. It's doesn't matter, this Wallpapers are Design Wallpapers that suite for your galleries collection on your computer, your mobile, or your own gadget. Other way to improve your Windows Performance is Turn Off any Unneeded Services on your computer's system. Choose the services that you really don't need it. You must consider it to learn the next steps !!! click properties (or double click mentioned service). - On StartUp type: choose 'disable'. - Service status: When on started condition, click 'stop'. - Choose The Services to Stop and Disable follow your necessity. Do you want to change your Windows folder ??? Great, this software is the answer !!! 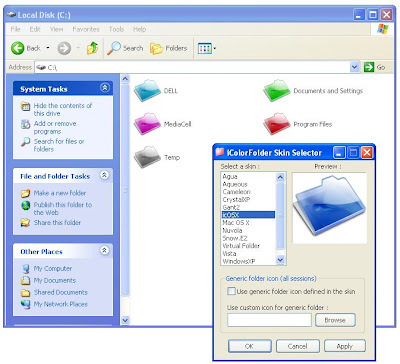 iColor Folder - Change Your Windows Folder. iColorFolder adds to context menu the Color Label feature of Mac OS X. Its is skinnable and is provided with a Skin Selector. iColorfolder is programmed in C++ and should no require any dependencies or Framework. - 4 folder skin selector (Agua, Mac OS X, Vista, and Windows XP). - Change the Skin, execute iColorFolder.exe or use the entry in the Start Menu. - Use custom icon for generic folder (browse on your computer). - Color Label - To choose the color you want to display. - Change the icon of all the files with a specific extension. - How to build the sources & How to create a skin. Heart On Fire Screensaver shows a beautiful animated burning heart on your desktop. Burn Your Desktop Today !!! 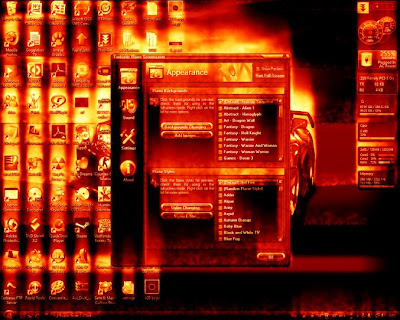 Fantastic Flame Screensaver is the award-winning screensaver generates a realistic fire effect. The flame is sensitive to the background, so each item on your desktop - including icons and all open windows - will appear to catch on fire, glowing and emitting a smoke effect. * Unlimited number of color combinations of the fire. Really FANTASTIC flame! * Flexible presets system. A lot of ready fire styles comes included. * 'Random' fire style. You never get tired of watching! * Lots of awesome fire backgrounds! mode. A pretty fine effect - burning images to another ones! watch and relax! Some music titles come included. intensity and wind direction available! * Full dual monitor support. Danger! Fire around! want by pressing a hotkey. Let's scare your friend! A Unique Theme that's inspirated by default Mac OS theme from Apple Incorporated. With this theme, your computer desktop looks like Mac OS desktop. Mac OS is a Operating System (OS) from Apple Inc. This themes also ready with 3 Attractive Color Schemes. This themes looks like AERO Themes in Windows Vista. If on AERO Themes mostly filled with Blue-Futuristic Color, but on this themes dominated with Black-Retro Color. Let's decorate your desktop and be cool everyday !!! X-pression your style today !!! New Beautiful and Amazing Screensaver for your computer. It looks The Fishs swim beautifully and Marine Aquarium freezes, wow very interesting !!! - Clock, Calendar, Day-Date-Time (displays on reef). Edit the screensaver on the options of this screensaver. Now, Marine Aquarium Screensaver ready to makes your desktop beauty and interesting !!! Are you using Google Search Engine ??? If that's true, you must get this program !!! Google Hack, is really helps you when using Google Search Engine. That's mean you can search your favorite categories of files/data with this program and optimal result. This program is freeware, special for Google-Lovers. Searching process will working on your default web browser (IE, Opera, Mozilla, Google Chrome, etc). JK Defrag is a disk defragmenter and optimizer for Windows 2000/2003/XP/Vista/X64 and higher. Completely automatic and very easy to use, fast, low overhead, with several optimization strategies, and can handle floppies, USB disks, memory sticks, and anything else that looks like a disk to Windows. What is the Google Chrome ??? >> Type in the address bar and get suggestions for both search and web pages. >> Access your favorite pages instantly with lightning speed from any new tab. >> Get desktop shortcuts to launch your favorite web applications. Very Cool for you that's have mysterious personality, dark-holic, and if you're a secret person. Let's show your DARK !!! This program function is to Uninstall Your Programs until the details of the uninstalled program. That's mean with this program, your chosen program will be uninstalled until the registry and junk files of the chosen program. This is good Uninstallation Program and very functionable for your computer. This program also has many features to improve your computer system and your computer stability. In this themes, Green-Vista atmosphere is really real emblazon on your desktop. Like Vista theme, but it has decorated with many change of elements. Design and Fashion Your Desktop Now !!! This application program has many features to makes your computer performance becomes faster, high speed, and optimal works. I love this application so much !!! -'Optimization' for your Memory(RAM), CPU, Disk, Internet, and Start Up Optimization. -'File Shreder', to permanently deleted file/folder. -'Uninstall' feature to uninstall your chosen application programs. 'WinRAR' Program function is to compress and collect your chosen files/folders become one in smaller size. This program also to 'extract' the compressed files/folder (.RAR, .ZIP, etc). There are also many Cool Skins for this program from me, so your WinRAR looks so cool and different with other WinRAR programs. The Function of this program application is to find your files that duplicated (more than one) on your hard disk. You can delete that file (duplicate file) dirrect from this program application (if you not needed thats files). This is more efficiency, more easy, and more happily (maybe...). 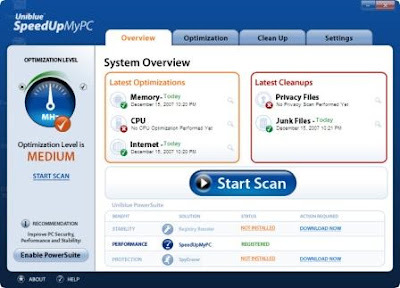 This is Freeware Cleaner program (application) but it has very useful functions. This Program is very popular in the world. I'm also used this program because its solve my computer problems easier !!! I'm very glad when I have this program !!! 2. Fix your "Registry Integrity" that's not needful. 3. Uninstall your programs, so you dont using "Add or Remove Program" again when you will Uninstall your programs. 4. Manage your "StartUp Programs". 5. OPTIONS, additional useful function from this programs. This application will make your computer system stable again when your computer not in use for a few minutes (Your computer status not Turn Off). 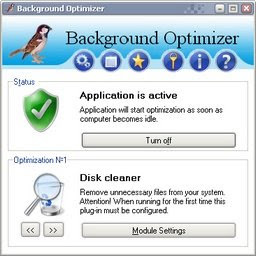 This application has many functionable functions or modules such as Cleaner,Defrag,etc that is working when your computer not in use. You can also download any modules from http://b-optimizer.com/modules.html, so your computer system is always in best condition !!! You must try this program and get the best condition on your Computer System !!! This program application's function is to Speed Up Your PC in Minutes like the motto of this program: "Speed Up Your PC in Minutes !". There are also many good features that makes your computer become more fast, more attractive, more cool, more unique, and more dilligent. This is portable application, so you don't need to install this program before.